UPDATE: City News Service reported LAPD Bomb Squad detonated the vehicle around 10:48 p.m. Streets were reopened shortly after midnight, after authorities found nothing hazardous in the car. 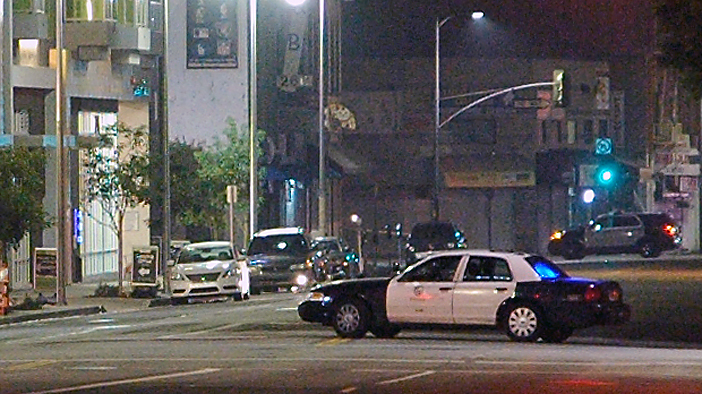 Traffic in Little Tokyo was snarled for hours Friday night, after the discovery of a suspicious vehicle prompted the Los Angeles Police Department to close off several streets in the area. A white Nissan Altima was discovered to be illegally parked on the east side of Los Angeles Street, between Second and Third, around 4:40 p.m., an LAPD spokesman said. The car was to be towed from its location, near the driveway of the new AVA housing development. An employee of the Little Tokyo Branch of the Los Angeles Public Library, directly across the street, told The Rafu Shimpo that a tow truck was arriving when staff members were leaving at around 5:30, after closing the library. It was soon discovered that the Nissan had been reported stolen. Some items inside the vehicle were deemed suspicious and police quickly cordoned off the vicinity, stopping traffic in an area bounded on the north by First Street, San Pedro Street to the east, Third to the south and Main to the west. Several residents of the AVA were evacuated as a precaution, and some were still milling about outside the evacuation area after 8 p.m. The LAPD Bomb Squad set up a command post on Third Street, and at approximately 8:15, a robot was sent to inspect the suspect vehicle, which was parked a little more than a block away from the LAPD’s headquarters. Given the terrorist events that have stunned Paris this week, the local authorities seemed on heightened alert, unwilling to take any chances in a situation that can often seem a routine inconvenience in the downtown area. So was there a detonation or was there nothing in the car? This story originally appeared in 2013. Why it’s showing up now is anyone’s guess. This happened on Friday, Jan. 9, 2015.